The Waterton Lakes town site is now OPEN. The forest fire which was burning in Waterton Lakes National is now under control and no longer a threat to the town site. 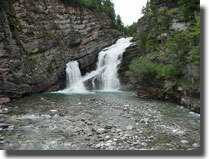 The east side of Waterton Lakes National Park is open as well. Some hiking trails will remain closed for the remainder of the year but one great hike that is open and highly recommended is Crooked Creek Falls. For more information on open areas and closures, please visit: http://www.pc.gc.ca/en/pn-np/ab/waterton/securite-safety/feu-fire-kenow. Waterton is quiet, uncrowded National Park. The Perfect place to view spectacular scenery, wildlife and enjoy outstanding recreational opportunities. Discover nature at its best... Year Round!... A rare gem tucked into the southwestern corner of the province of Alberta, Canada. In this breathtaking part of the world, the majestic Rocky Mountains rise suddenly out of the rolling prairies. Amid the peaks are the lakes of Waterton Lakes National Park, carved out of the rock by ancient glaciers.